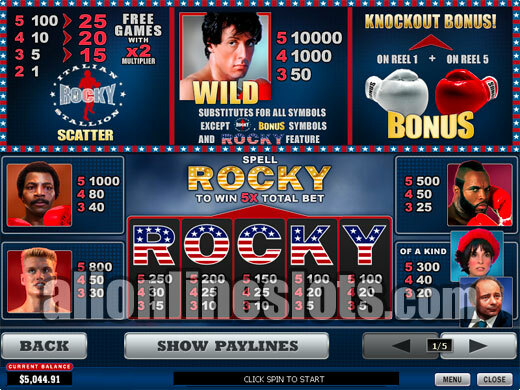 Rocky is a 25 line Playtech video slot based on the hit films starring Sylvester Stallone. The game has two bonus features with free spins and a Knockout Bonus. A lot of scenes from the films are included which really add to the theme. 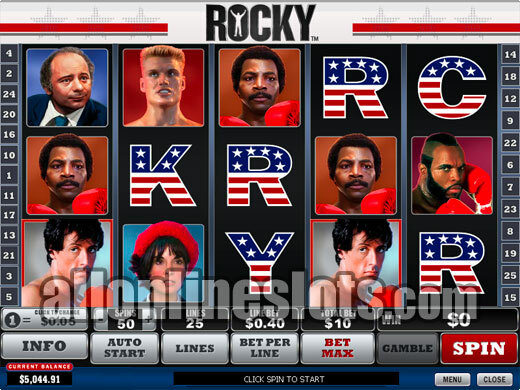 Rocky is a 5 reel, 25 line slot machine based on the hit Rocky films that started with Rocky in 1976. The game joins a growing list of move theme slots that Playtech has released with other games including Gladiator and Iron Man 2. Playtech have done a great job with the theme and the game really captures the feel of Rocky. On the reels you have the main characters from the films including Rocky (Sylvester Stallone), Adrian (Talia Shire), Paulie (Burt Young), Apollo Creed (Carl Weathers), Clubber Lang (Mr. T) and Ivan Drago (Dolph Lundgren). A win with any of the characters turns the symbol into a short scene from on e of the films. Rocky has some of the widest betting limits of any Playtech slot with coin sizes ranging from 0.01 to 5.00. With a max bet of 250 coins this gives you a max bet range of between 2.50 and a very big 1,250.00 per spin. Rocky is the wild symbol and substitutes for everything but the scattered logos and the bonus Gloves. Getting five Rocky wilds on any active line awards the top line win of 10,000 coins or 100,000 coins if you are playing max bet. 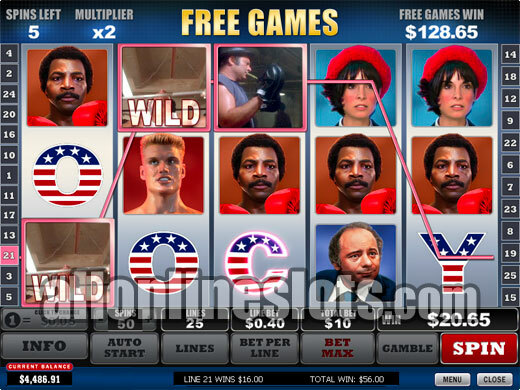 Second highest line win is 1,000 coins for either five Apollo Creed symbols or four of the Rocky wilds (aligned left to right). 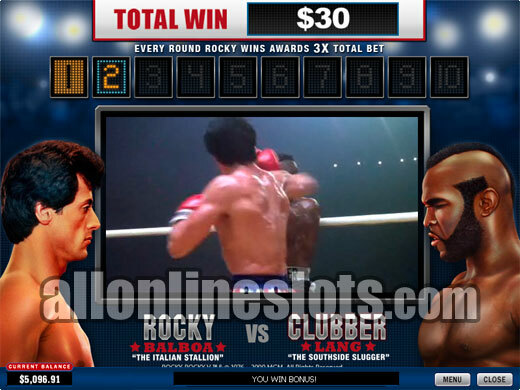 From there all of the next highest line wins are made up with the other characters from the films with five of a kinds paying 800 (Ivan Drago), 500 (Clubber Lang) and 300 (Adrian or Paulie). All of these wins can be multiplied by up to 10 depending on your bet per line. Instead of having the now very common A, K, Q, J and 10 symbols, Playtech have gone for R, O, C, K and Y symbols to make up the lower pays. This is a nice touch and really keeps the theme going. As well as having pays for five of a kinds the game also has a special bonus where spelling Rocky left to right in any order awards 5X your total bet. On the first and last reels there are Bonus Gloves. Getting both gloves on the screen at the same time awards the Knockout Bonus. Once activated you move to a second screen where you can select one opponent for Rocky to fight (Preview). 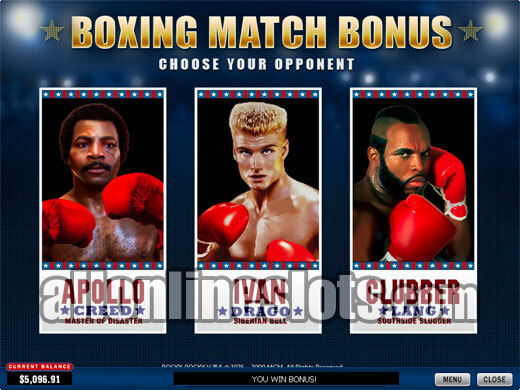 Once selected you move on the main bonus where a boxing match takes place. The fight takes place over 10 rounds and for each round you get to see a video from one of the films. If Rocky wins the round you get a bonus prize and if Rocky loses you move to the next round (Preview). If a knockout occurs and Rocky is the winner you win all rounds after the knockout. Overall a really impressive bonus feature. As well as the Knockout Bonus you can also win free spins. Getting three, four or five scattered logos awards 15, 20 and 25 games respectively. During the free spins all wins are doubled and more wild Rocky symbols are added to the reels. The free spins can be re-triggered an unlimited amount of times. Again when you start the bonus you get a scene from the film and another when the bonus ends. 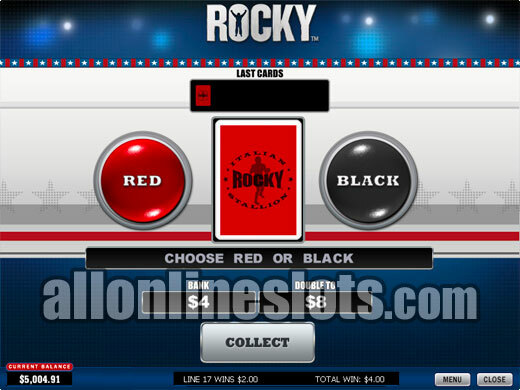 Rocky also has a red or black gamble feature where you can try to double up your wins. This is the only part of the game where we think Playtech could have done a bit more to include the theme. For example they could have used a boxing theme double up like the one found on the Prize Fight slots by Aristocrat. In the end, Rocky is a great example of how impressive online slots have become. It captures then theme well and has a good amount of high and mid level jackpots with lots of features thrown in. If you're a fan of the Rocky films then this game is a must play.